Select a stone/pebble which is large enough to hold a door open. Wash the stone and once it has completely dried, paint the entire stone in a base colour of your choice. Allow the base coat to dry completely. 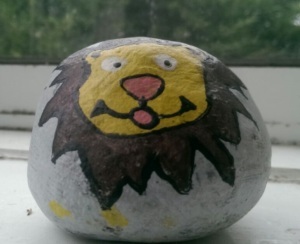 Use coloured pens/pencils to draw a picture on the stone. This can be as simple or complicated as you like (the picture is a guide for you to paint next) – we’ve drawn a lion. Use brightly coloured paint to bring your picture to life. Glitter can add an optional final sparkly flourish. Allow the picture to dry completely. Once the stone has dried it is now ready to use as a doorstop. If you would like to add a final protective layer to stop the paint getting scuffed, mix together some PVA glue with water (one part glue to two parts water). Apply the PVA glue mix all over the stone. When this has dried it will provide a clear, shiny gloss to the finished doorstop.